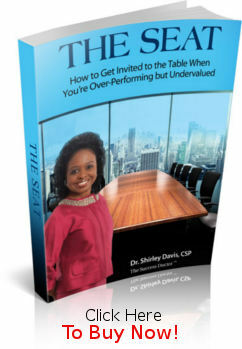 “How do I get a seat at the table?” As a success/career coach, I’ve been asked this question by women, people of color, Human Resources professionals, salespeople, insurance agents, new college grads, and so many others trying to crack the code of understanding what it takes to simply be noticed, validated, and invited to the table, especially when you are working hard, diligent about getting the work done, going the extra mile and doing much more than your job description calls for or that your paycheck shows. When asked this question, I hear the frustration, disillusionment, and disappointment. And not only do I hear it, I understand it and I relate to it, because I’ve asked the same question myself. I spent years trying to break through the brick walls and glass ceilings, the carrot principle, and pervasive biases that continue to plague many of our organizations and that keep great talent from achieving equity and access to opportunities. As I moved up the corporate ladder and ultimately to the senior executive ranks, I also experienced many setbacks and learned lots of lessons along the way. Please share your story and your journey in trying to get a seat at the table. What has been your experience? What strategies and tips worked and what didn’t work? What lessons did you learn? What questions do you have? This community of sharing stories is designed to inspire, empower, educate and network from others on how to succeed in the world of work and the game of life. Expert coaches will respond to questions so that everyone can learn and achieve together. Thanks for sharing your story, strategies and success. “The Seat” Is Available Now! © 2019 All rights reserved. Site by Norman.